Easter weekend is family time, so the movie theaters don’t exactly get a lot of love. One film hopes to be the year’s first good romance, one hopes to capitalize on that family spirit and the last is celebrating Earth Day. If none of these tickle your fancy, don’t worry, because summer movie season is just around the corner! The Word: Based on the best-selling novel, this story of circus wonder and romance packs the one-two punch of Pattinson and Witherspoon, which ought to account for 80 percent of the female moviegoing demographic. Shockingly, “I Am Legend” and “Constantine” director Francis Lawrence shot the film, which tells the story of a young man who falls for the star of the circus he works for, who most definitely is married to the manager. My Thoughts: There are a lot of sparkling talents here and with a built-in book-loving audience, its likely that even with a poor late April release that many will make a concerted effort to see it even if the box office numbers are not reflective of it. Its “come listen to an old man tell the tale of a forbidden circus romance way back during The Great Depression” vibe has a distinct resemblance to “The Notebook,” to say the least. Recommendation: Looks like a reasonable gamble for romance fans who have been deprived thus far in 2011. 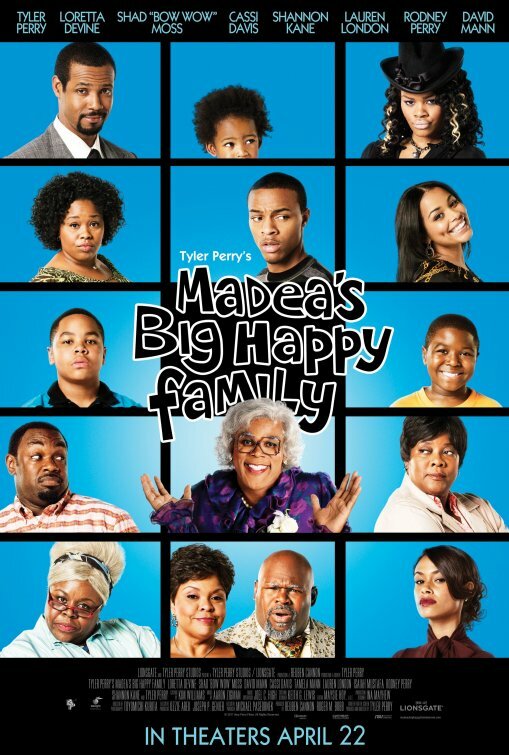 The Word: Tyler Perry dons the fat suit and drag for a seventh time in a full-length film, though only the fourth actually centering on his famous character Mable “Madea” Simmons. The character has become a household name in black entertainment and the franchise has become one of the most bankable. In “Big Happy Family,” Madea must round up her niece Shirley’s three troubled and estranged children who don’t know that Shirley has some health problems. My Thoughts: Perry’s films, namely comedies, never get good reviews, so if you don’t fit the black niche market, there’s nothing to appeal to you. That said, 33% is not half bad for one of his films on Rotten Tomatoes, so it might not be a bad time to test-drive one of his films if you can’t get ahold of one on DVD. Recommendation: It either appeals to you or it doesn’t. The Word: DisneyNature delivers a third straight Earth Day film for families looking to get an education National Geographic-type experience in theaters. 2009 was “Earth,” so a very broad portrait of the planet’s creatures, 2010 was “Oceans” which limited the scope to 75 percent of the Earth’s surface and now “African Cats” focuses on the lions and cheetahs of Africa. Much more narrow, wouldn’t you say? 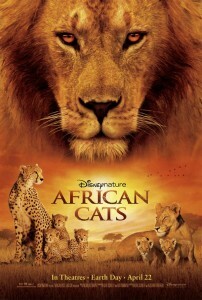 My Thoughts: The focus here could be very good for a DisneyNature film that is what it is. You might actually get the sense of more of a story with the focus on a lion pride and such. Clearly these films are beloved or Disney wouldn’t keep distributing them to a thousand or so theaters. Recommendation: Might be worth it if you’ve passed on this Earth Day ritual with kids the past two years. 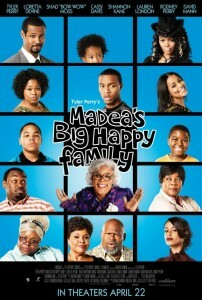 Easter weekend has been a tough egg to crack, but not if a Tyler Perry comedy is in the picture. The man seems to have this weekend cornered every other year. His last two comedies to release at this time made more than $30 million, which will be enough for Madea’s Big Happy Family to beat out a second strong week from Rio. With the lack of options in the romance genre thus far, some good star power and a popular book adaptation, I suspect Water for Elephants will be an easy fit for third place. Maybe around $15 million, which will be heads and tails above the other finishers. It’s Easter weekend, so there’s no reason that Hop should fall very far at all. It’s been a few weeks, but without tons of other options, I suspect a good $8-10 million, which should be enough to hold off African Cats. This will be the first DisneyNature Earth Day film to open on a Friday. The first two docs opened with $8.8 and $6.1 million on a Wed. and Thur. respectively. I think a return to the $8 million range seems likely. It would be a shock if either of those two films lost to “Scream 4” as horror films and excessive sequels are the two most notorious genres/kinds of films when it comes to bad second weekends.